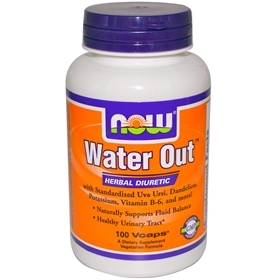 NOW Water Out is a synergistic herbal blend that supports urinary tract health. Uva Ursi, Dandelion, Goldenrod and Juniper are herbs that can help to relieve minor, temporary water retention while supporting healthy kidney function. These and other ingredients in Water Out are known to act in a gentle manner to maintain water equilibrium, as well as essential electrolytes. Dandelion root is an excellent diuretic. Potassium is often lost when using a prescription diuretic, but dandelion root is safe, and works very well. It helps eliminate deposits of toxic substances in the kidneys and the urinary tract. The disinfectant properties of dandelions also inhibit microbial growth in the urinary system. Uva Ursi supports diseases of the bladder and kidneys, strengthening and imparting tone to the urinary passages. The diuretic action is due to the glucoside Arbutin, which is largely absorbed unchanged and is excreted by the kidneys. During its excretion, Arbutin exercises an antiseptic effect on the urinary mucous membrane, making it useful in inflammatory diseases of the urinary tract, urethritis, cystisis, etc. Bladderwrack contains magnesium that flushes excess fluid, allowing it to act as a natural diuretic, which reduces bloating. Suggested Usage: As a dietary supplement, take 2 Vcaps® twice daily with meals or a glass of water. Consider taking this product in combination with NOW® Magnesium & Potassium Aspartate, Cranberry and D-Mannose. Other Ingredients: Cellulose (capsule), Rice Flour, Stearic Acid (vegetable source) and Magnesium Stearate (vegetable source). Vegetarian/Vegan Product.